As an android developer, in how many apps you have checked a field is empty or not? Entered email is correct or not? Data connectivity is available or not? What is the current location of user? Forms, data connectivity, validations, images, preferences, downloading files, user’s locations, notifications, map, dialogs, toasts, etc have now become common requirements in the apps. 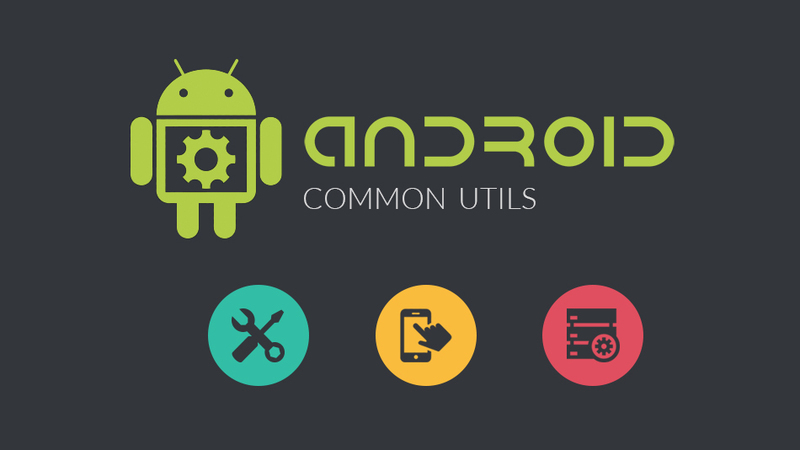 CommonUtils library is developed to reduce efforts to achieve common features of the android apps. While developing the apps, we realized that we’re coding for many common features in all the apps. For e.g. check the network’s availability, using shared preferences, parsing, etc. And like us, many other android developers might be doing the same. So we thought that it needs to be reduced for all to save the development time with ease. This is how an idea popped in our mind, and we decided to develop an SDK which can reduce developers’ time and efforts. You can get the code from GitHub. You can add your own methods that can reduce developers’ time and efforts. Any improvements, changes and suggestions are welcomed. Here is the demo apk file that you can install and check in your devices. You can download it from Google Drive. This SDK includes 64 common methods as of now. You can go through them below. This method is used to check whether data is available or not in EditText. Returns true if data is available, else false. This method is used to check network availability in device. Returns true if network is available, else false. This method is used to check whether email is valid or not. Returns true if email is valid, else false. This method is used to get current date in string format. strDate (Pass date format as a string). Current Date in string format, otherwise returns null. This method is used to get device Id. Note: You need to add following permission in manifest file READ_PHONE_STATE. Device Id in string, otherwise returns null. This method is used to set string preference. This method is used to get string from preference. This method is used to clear all the preferences from device. This method used to get current location. This method is used to apply pinch zoom functionality on image. This method does not return any value. It just applies Pinch Zoom on ImageView. Use this ImageView in xml file. This method is used to get application launcher icon. drawable of the application launcher icon. This method is used to send local notification in application. This method is used to get random character. This method is used to disable sleep mode while using application. This method is used to enable sleep mode while using application. This method is used to open image from given directory path. This method is used to open video from given directory path. This method is used to open URL in mobile browser. This method does not return any value. It just redirects to browser. This method is used for getting location on Google map using specified address. This method is used to create directory on specified location. Returns true if folder created else false. This method is used to download image from specified URL. This method is used to open DatePickerDialog and get selected date in TextView. This method is used to open TimePickerDialog and get selected date in textview. This method is used to get number of files available in specified sdcarddirectory. It returns number of count in int format. This method is used to calculate number of days between two dates. Note that, both the dates must be in same format. It returns long value of date difference. Positive value for future days and negative value for passed days from current. This method is used to convert String Date to Date format. It returns Date in date format. This method is used to get device height. This method is used to get device width. This method is used to get random number. For e.g. if you want to get random number up to 999. It returns any random picked number. This method is used to set postfix to a number. For e.g. pass 10, it will return 10th. It returns number in string format with added postfix in it. This method is used to convert comma separated string to array list. It returns ArrayList of comma separated string. For more methods of this SDK, look for the part-2 of this post. However, you can always refer the PDF doc from GitHub.